There are shining examples of fruitful collaboration between universities, industry partners and start-ups. Many ideas from research in universities are put to use through collaboration between universities and firms. Others reach the market through licensing or start-up companies. Jean-Marc Frangos, chief innovation officer at BT, said: "BT’s university and start-ups collaborations have reaped great rewards. We jointly developed field scheduling algorithms with University of Essex that have resulted in 400,000 extra engineering tasks performed a year. We have also launched innovations in the UK based on a number of start-ups technologies, for instance recently re-inventing the digital customer relationship with Enjoy’s home experts." Endeavours to find solutions to complex social, environmental and economic challenges – for example, in energy, environment, health or security – have increasingly required collaboration between universities and industry because few organisations have the internal capacity to deliver results on their own. Universities, academics and their funders also wish to see results from their research put into practice. There is a trend amongst current cohorts of students to explore entrepreneurial careers, often with a focus on social enterprise. A multistakeholder group of experts in technology transfer recently met in Tianjin, People’s Republic of China, at the World Economic Forum’s Annual Meeting of the New Champions, and identified a number of common challenges and opportunities that warrant further exploration and discussion. 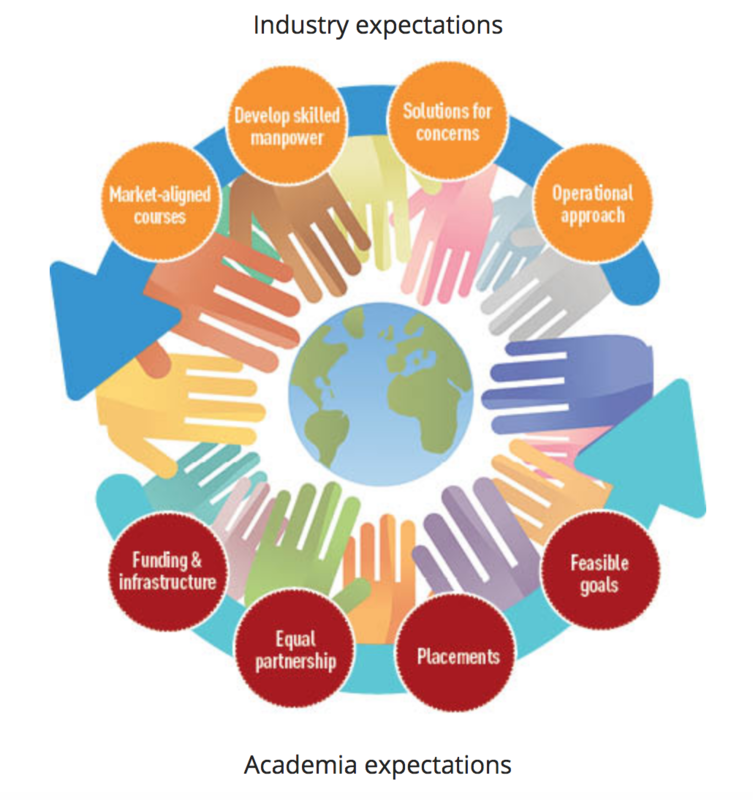 University-industry collaboration requires careful management and can bring many benefits. These include a two-way flow of ideas: results can flow out to industry and they can also be in-bound to fuel research questions. For example, sometimes technical problems experienced at the cutting-edge of practice lead to new questions for science. Industrial collaboration of this type can also be an important means of diversifying income streams for fundamental research. But universities may need to modify their incentives and arrangements for staff – including tenure and promotion criteria – if they are to reap the rich rewards from deep collaboration. In certain technological fields, universities may face brain-drain if they do not proactively collaborate with industry. At the top of many people’s minds is the keen interest of industry in recruiting academic experts in fields like artificial intelligence, data science and other hot technologies. In 2015, for example, Uber hired 40 researchers away from Carnegie Mellon University. And in 2016, the Financial Times reported that many top artificial intelligence talents were being poached by industry from the ivory tower. Academia often loses to industry as pay in the former sector is comparatively low. This transfer of brainpower has critical long-term ramifications for universities as it narrows the pipeline of those who can teach the next generation, with ever-pressing knock-on effects. Certain professorial fields risk becoming endangered species. Is there space for a virtuous model, one where industry leverages some skills from academia, allowing for a healthy exchange of ideas and know-how? One model is the example of Applied Brain Research (ABR) and the University of Waterloo. Founded by the researchers of the Computational Neuroscience Research Group at this university, ABR operates from within, with the professorial lab and the industry research group located in proximity. Perhaps more fully than others, the University of Waterloo embraced and facilitated collaboration with industry. ABR nurtures a culture that encourages their researchers to publish their work, and supports involvement in both ABR and their academic labs. Peter Suma, co-chief executive of Applied Brain Research, said: "In this age of AI and other companies pouring over the most recent research to keep ahead, and researcher retention being of prime importance for both companies and academia, there are great advantages for the lab and the company to compromise using innovative and flexible new approaches to commercial and research work balance, IP and space use." Another model being explored is flexible schedules for faculty involved in industrial research. The reality is that pure research and commercial interests are closer than ever, and it behoves us to shape them in a direction that is valuable for both parties. Some universities, like Imperial College London, were founded on the mission to conduct the best possible research, deliver excellent teaching and to put ideas into practice. Imperial works in partnership with more than 500 companies and has corporate partnership and customer-account processes in place to manage all aspects of relationships including IP and technology transfer. Collaboration with industry and forming new ventures is embedded in its culture. Martha Crago, vice-principal of research and innovation at McGill University, Canada, said: "The social sciences have a dual role to play. There are researchers whose work becomes the basis for innovative products, processes or services. ‎These are not often commercialized due to a lack of familiarity or culture for doing so, but their work on the societal impact of fast-paced technological innovation has become essential in today's world. This is a peak time for science and technology and social sciences t‎o work hand in hand." Social sciences do not have as strong a history of technology transfer as engineering or the life sciences and computing, likely because one of the social science methods is based on dispassionate critique where it is not possible to interact with the subject being studied. Nevertheless, some elements are ripe for collaboration with business. Social sciences have a role to play in addressing the technical needs of the legal sector via artificial intelligence. Behavioural sciences are more relevant to business than ever, reaping the benefits of social data mining. Tech transfer from university to industry is not a one-size-fits-all scenario. Sometimes research occurs in the university and then is commercialized outside of it, other times commercialization begins already during the research phase. Deep-science company Quintessence Labs, for example, was born out of founder Vikram Sharma’s idea to explore the commercialization of the quantum sciences. In the early 2000s, the commercial environment was not yet ripe for such a concept, so Dr Sharma took his research forward within the university context, and with the support of government funding. Nevertheless his objective was always commercialization of the technologies, so his search for corporate backing began during the research phase. Government grants can fill gaps where private funding is not readily available, however conditions on such grant monies can impact the ability of nascent companies to grow and unlock follow-on funding. Government grants do play a vital role in technology development, particularly technologies with medium-to-long term horizons. Where tech transfer offices can add value for both the university and industry is in navigating grant applications and in helping companies to scale faster – they can provide the know-how to unlock necessary funding for the company to thrive. There is also a question of how to ensure more tech transfer out of more universities – how to enable corporate partners to interact with universities more efficiently. The successful evolution of the role of tech transfer offices in universities, and the start-ups and corporate partners that work with them, will require an increasingly holistic view of all the innovation ecosystem factors, expanding their influence beyond the narrow role of tech transfer, and continual experimentation.